Sized for Bratwurst, German, Polish, etc. Our natural sausage casings come packed in salt. The smaller consumer pack may contain shorter ends and pieces. Prepare them at least an hour before use. Wash casing in cold water to remove salt and check for breaks by running water through them. Keep casings in cold water mixed with a little vinegar until ready to be used. Our Natural Hog casing have a diameter size of approximately 32/35mm. 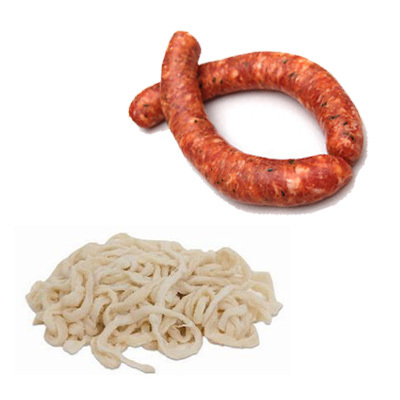 Use hog casings for smokies, Italian sausage, bratwurst, chorizo or German sausage. Consumer pack will do approximately 25 pounds of meat.